4 bedroom, 2 bathroom house with 3 living areas & extensive views. A modern beachhouse in a semi-rural setting. The house has wide paved areas and extensive garden. It sits high on the block with farm land on the Northern boundary and views to the south, east and west. Enjoy the luxury of space. The house is well proportioned, sited on a large block and has expansive views of the Willunga hills, the beach and farmland.The 2 storey holiday house features rammed earth walls, polished concrete floors and lots of jarrah. Large windows frame the scenery in all directions. The beach is accessed by a 5 minute walk through the Willunga Creek Linear park. The fully equipped kitchen has a dishwasher, big fridge , microwave and coffee machine. Outside there is a BBQ with a wok burner . There is a double lockup garage. This house is close to Port Willunga Beach. It is a very short drive or bike ride to all the wineries of McLaren Vale and Willunga. Please note that pets can not be kept on the property and there is a non-smoking policy. In total there are four bedrooms and the house sleeps up to eight people. There are three bedrooms downstairs. Bedroom 1 has a queen size bed. Bedrooms 2 and 3 have two single beds in each room. Upstairs in the parents' retreat there is a queen size bed. The dining table seats eight. The house has three living areas. There is a big leather lounge in one of the downstairs areas. Big glass doors open onto the garden and to views of the linear park, the historic part of Port Willunga and to the Willunga Hills beyond. The second living area downstairs has a lounge,TV and DVD player. There is a fully equipped laundry and a bathroom next to the second living area. The area has evaporative cooling. We call this part of the house the parents retreat. It is 9m by 7m has polished jarrah floorboards and a cathedral ceiling. There is a queen bed and an ensuite as well as a lounge area perfect for relaxing. The area has reverse cycle airconditioning. The balcony deck upstairs is a great place to enjoy the surroundings. The elevated location enables you to take in the views of the farmland to the north, the Pt Willunga Beach to the west and the Willunga Hills to the south. Sunrises and sunsets are special. All linen including bath towels, tea towels and beds made up for your arrival, are included in the price as are standard cleaning charges. A folder with information about the appliances is left for your convince. We encourage you to read this important information to make your stay hassle free. 2 bathrooms: Ground floor bathroom has a shower and bathtub. Upstairs is an ensuite. Short walk through linear park to boardwalk onto the white sands of Pt Willunga Beach. Bike and walking tracks along cliff top. 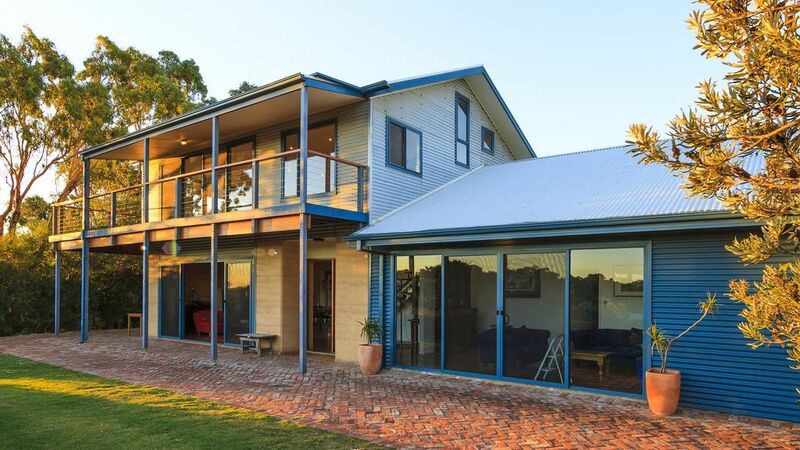 While situated in the Port Willunga village the house backs on to the start of picturesque rural properties. Views to the Willunga Hills and into the Port Willunga linear park. Reverse cycle upstairs. Evaporative downstairs. 6Gb allowance per stay. Extra use charge at cost. 3 living areas. One upstairs. Open lounge space adjoining kitchen/dining and TV room downstairs. Only use environmental products supplied. Basic supplies. Oil, salt pepper, sugar. Alfoil, wrap and bake paper. Sea views from upstairs deck. Rural outlook. Vine covered patio. Use of the wood oven is subject to conditions based on the season, fire restrictions and the availability of special equipment to operate the oven. Please enquire about its use if you are interested. Additional charges apply. We had a lovely time here. Sue met us and showed us around and then we were left to enjoy the place ourselves. Comfortable, very clean and good amenities all add to an enjoyable stay. Would recommend this house for a group or family stay. Thanks Anne. So glad you enjoyed our house and its great spaces. Early December can be a perfect time to stay. We aim to provide well for a group of adults or families. This is a great home if you are looking to enjoy the best of the beach and the nearby McLaren Vale wine region. The home is bright and spacious with a beautiful outlook and garden surrounds. The perfect place to relax and unwind. Thank you Matt. Great to know you loved the beach house as we do. It is a special place in South Australia and we love sharing it with those looking for all it, and the wonderful area, has to offer. Really spacious house in a quiet street, but just a hop skip and proverbial jump away from beautiful Willunga beach. Will be going back, don’t book this place when we want it next thanks. It is great to know you loved our house and it’s location as much as we do. Thank you for leaving it so clean and tidy. Love to have you back. My family and I had a wonderful stay for 3 nights. Fantastic location with short walk to the beach. Thank you James for the review. So glad you enjoyed your stay. Thank you for taking such good care of the house. Love to have you back again. great views and well appointed beach house and close to beach and facilities. Glad you enjoyed your stay. Would love to know what we can do to make your stay more comfortable.